A muscle car restoration project is only complete when the interior of the vehicle is back to original, "just left the dealer's showroom" condition. And if you plan to show the car and bring some hardware back home with you, a professional-grade interior restoration is critical. But do you really need to spend thousands of dollars to acheive professional results? Not necessarily. In this book, author Daniel Strohl, gives you expert insight into what's required to properly restore a muscle car's interior. 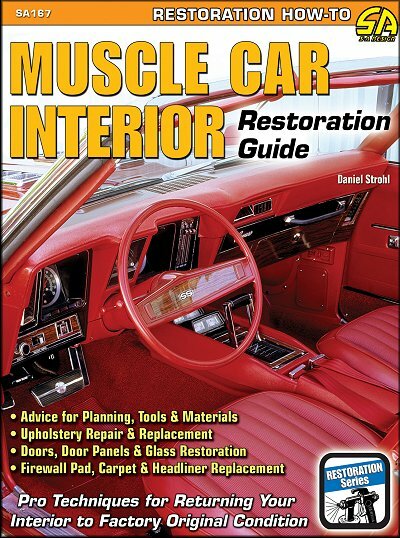 From tools to materials and techniques to procedures, Muscle Car Interior Restoration Guide is the how-to manual you want to read to get pro results with your project vehicle. Instrument panels, dashboards, firewall pads, steering wheels and columns and more, are all covered by this guide. And Strohl does not stop there. The car's carpet, the headliner, doors and door panels, convertible top and even electrical wiring restoration are all addressed. So, if you want to restore your muscle car's interior to show-winning levels, Muscle Car Interior Restoration Guide is the book for you! Pop quiz. You've just bought your first muscle car. You saved your pennies for years to buy the exact car you've dreamed about, stripes, scoops and all. To the consternation of your wife, you cleared out a spot in the garage just for it while the transporter hauled it halfway across the country. Your coworkers can't wait for it to arrive, if only so you'll shut up about it around the water cooler. It finally arrives, bumpers gleaming, Hurst shifter beckoning from between the bucket seats. You roll it off the truck, sign the papers with the transporter, and finally, it's all yours. If it runs, you put the plates on it, grab the wife, and take it for a quick spin around the block, rapping the throttle so all your neighbors hear it. You then give it a good wash and back it into the garage. While admiring it and ignoring your wife's calls to come to dinner, which one of these do you do? Open up the resto catalogs you've accumulated and start ordering every little part you'll need to whip this muscle car into tip-top shape. Yank the nasty seats and headliner and toss them to the curb. Sell off the original parts in anticipation of new reproduction parts. Pull and pile the original parts in the corner of the garage. As mentioned earlier, the interior is about 95 percent of what you'll see of your muscle car while criving it. Most of the interior that you'll see while driving is right in front of you: dashboard, instrument cluster, center stack and console. Your car's designers carefully chose the layout to serve several functions. The entire assembly has to be pleasing to the eye without being distracting. The dash itself has to have the right materials to prevent glare. The instruments have to convey sometimes complex and rapidly changing information at a quick glance. So when something's just not right with any of these components — when a gauge isn't responding, for instance — your eye tends to focus on that and not on the road. The good thing is that you can now convince your wife that you need to have the dash recovered because it is a dafety issue, not just an aesthetics issue. Obviously, the best time to address your instruments is while you're addressing your dashboard. After all, if you're going to have to remove your dashboard to have it recovered, you will also have to remove the instrument cluster to lift the dashboard out anyway, so why duplicate your efforts by removing the instrument cluster again at a later date? You'll find once you do remove the instrument cluster on your muscle car that this is a complex part of the restoration. While cars of the 1930s through the 1950s had an integrated look and feel to their instrument clusters, with everything flowing into an art-deco or space-age theme, the instruments in muscle cars had a real back-to-basics appearance. When actually removing the instrument cluser from the dash, loosen the nuts that hold up the steering column and let the column hang a little lower, or remove the column altogether. If keeping the column in the car while you're removing the gauges, make sure to drape a towel or rag over it so the instrument cluster doesn't nick the paint on the column if you accidentally drop the cluster. Even though the printed circuit board eliminated a lot of wiring mess, you'll still encounter a good number of wires on the back side of the cluster, so don't just yank the cluster out of the dash once you'e loosened all the screws holding it in. Instead, carefully feel around the back of the cluster for the connector from the wiring harness and any wires for the dash lamps. You'll also need to feel for the speedometer cable and unscrew it from the cluster. Now would be a good time to unscrew the other end of the speedometer cable, clean the old grease off the cable insert, and apply new grease. The more grease the better. Technically, window sweeps are called window weather strips, and they've also been called by other names, including window fuzzies and cat wiskers. They're the soft, brush-like bristles on the inside of door windows, and the stiff rubber strips on the outsides of the windows. When they're not doing their job, they can often lead to scratches in the glass. One would believe their main purpose is to prevent water, dirt and dust from filtering into the door cavities, but according to Fritz Wurgler of First Place Auto Products, their main purpose is actually to hold the door glass in place (preventing it from contacting the metal inside the door) so it doesn't rattle. "When you can hear the glass rattling, you're actually hearing it scratching," he said. An associate editor on staff at Hemmings Motor News, Daniel Strohl has written and photographed extensively for Hemmings Muscle Machines and Hemmings Classic Car magazines, after leaving an award-winning career in newspaper journalism. A muscle car fanatic, Daniel lives in Bennington, Vermont. Ask a question about Muscle Car Interior Restoration Guide.